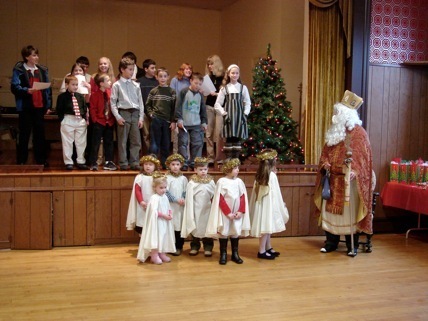 St. Michael’s in Woonsocket, Rhode Island, was blessed by a visit from His Eminence Archbishop Antony on their feastday in November, 2008. After visiting Ihumen Gregory (of blessed memory) in the hospital in Boston on Saturday, he and Rev. Anthony Perkins (St. Michael’s in Woonsocket) joined V. Rev. Roman Tarnowski, Hierodeacon Vasyl, and Reader/Seminarian Ivan Synevskyy (all from St. Andrew’s in Boston) in the celebration of Vespers. This was followed by an informal reception for Vladyka Antony in the parish rectory. 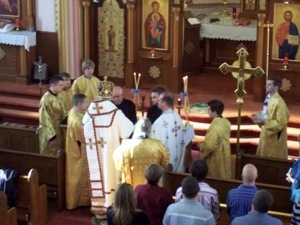 The next morning, His Eminence tonsured two men to service to the Church: Paul Cherkas was set aside as reader (Dyak), and John Meschisen was ordained as subdeacon. After the Liturgy, His Eminence joined everyone at the formal reception and feast. It was a joyous celebration of Our Lord’s Resurrection, of His archangelic servant Michael, and of the continued vitality of our Ukrainian Orthodox parish in Rhode Island.